A beautiful young elf is missing, and no one remembers her existence. To solve the mystery of his lost friend, Ean leaves the vale and embarks on a mission that takes him through dark forests and arid desserts. Solve dozens of adventure puzzles and explore an enchanting world. 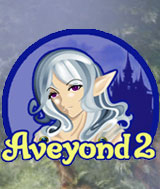 Aveyond 2 is packed with monsters, magic, and humor. Stop an evil queen from turning the world into ice, capture a dragon and ride the winds to ancient lands, unite the kingdoms and discover your destiny. Shapeshift Ean & dress Iya. Follow your own path via the karma system. Comments: This game is great for almost all ages, with many exciting storylines tied into one. the battle in this game are hard so i advise leveling up in easier areas before continuing on to the next area. Comments: This is a very nice RPG. It is a great game for the whole family, although the ability to read is necessary. I would advise you to level up and prepare yourself before you go to the human world as the creatures yoiu fight there are very much stronger than what you face in the elfin world. I didn't do this the first time I played and was unable to survive so I just started over.